You want to be cynical about politics. 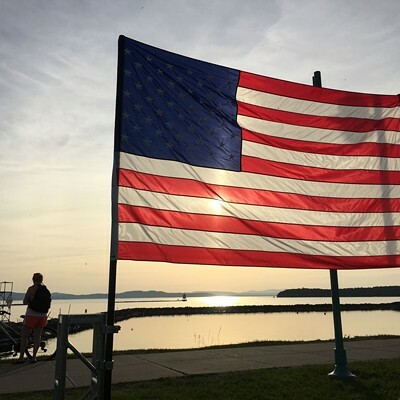 Even on a day like today, when volunteers and supporters flowed into a sun-drenched spot on the Lake Champlain waterfront to hear Sen. Bernie Sanders announce his presidential candidacy, it's easy to be jaded. The crowd, you fear, will be full of overly earnest volunteers, connected bigwigs, fawning hangers-on and prima donna journalists. The speech will be full of finely honed, red-meat sound bites. And doesn't everyone know how this is all going to play out, anyway? And then you meet Jennifer and Jonathan Tornabe. 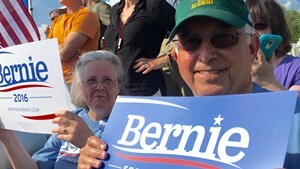 The Tornabes aren't Bernie fanatics — they only moved to Burlington a couple years ago, from Plattsburgh. They have never volunteered for a campaign, never attended a political rally, never donated to a candidate — they aren't even sure they've even voted. And yet the Tornabes may have been the first people to arrive at Waterfront Park for Tuesday's announcement, camping out under a shady tree five hours before events were scheduled to begin, to make sure they could be in position. 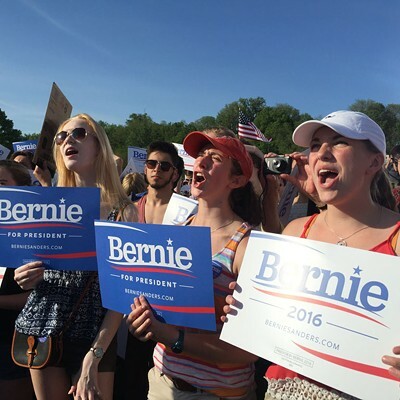 Their reason: They wanted to hear what Bernie had to say. The Tornabes struggle. They have lived off disability payments in subsidized housing ever since Jonathan suffered a traumatic brain injury when he fell on ice and was unable to go back to work. Jennifer has her own health problems. They have two young children and dream of sending them to college to give them better lives. But they have no idea how they will ever afford it. "We're just getting by," Jonathan Tornabe said quietly, as he sat 100 yards from the stage where volunteers were testing the sound system. 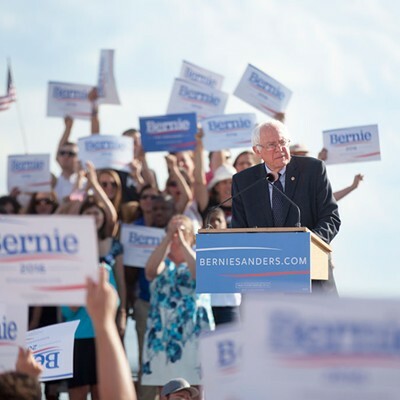 They have been trying to pay attention to the news, and in the past couple of weeks they have been intrigued by media reports about some of Sanders' ideas, especially his proposal help make college more accessible. 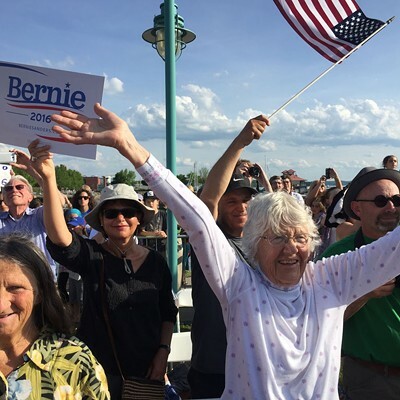 "I came home and she told me one of Bernie's things is to have college free, and I'm thinking, How is that possible?" Jonathan Tornabe, 40, said. "We've all heard about the budget. Where is all that money going to come from? I figured we'd come down here and listen to what he said. Right from the mouth." 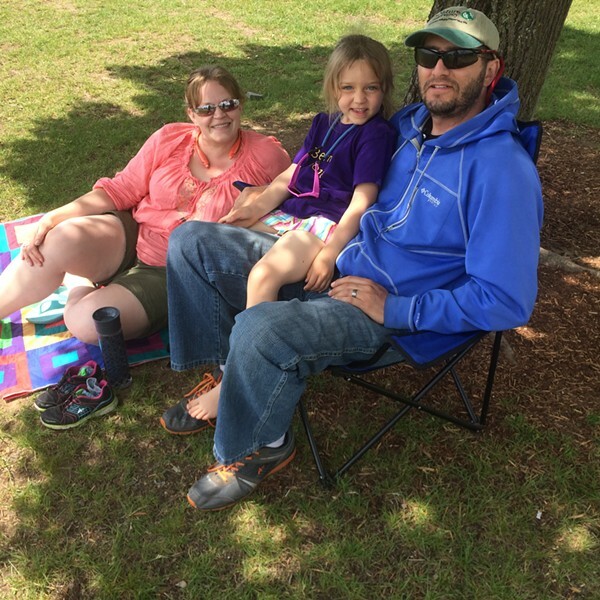 The Tornabes brought their 4-year-old daughter Jasmine to teach her to pay attention to current affairs. The night before, Jennifer made the girl her very own Bernie T-shirt. It's purple, with a yellow Bernie 2016 slogan. Nothing like the official shirt worn by Bernie volunteers and supporters, but Jasmine was pretty excited. 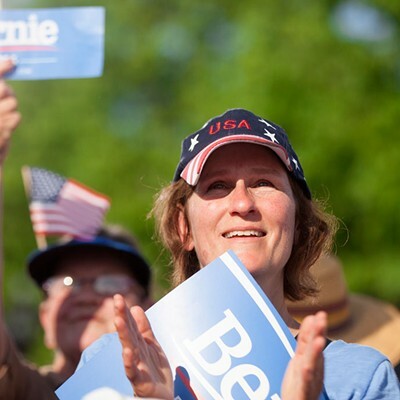 "I want the kids to have a better feeling about politics than I had," Jennifer explained. 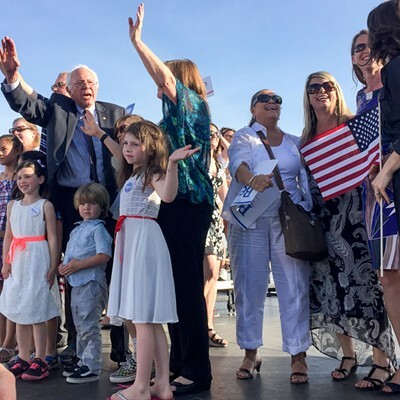 Jennifer, Jasmine and Jonathan Tornabe were among the first arrivals at Waterfront Park, five hours before Sen. Bernie Sanders was scheduled to speak. Others began trickling in as the afternoon went on. Chittenden County State's Attorney T.J. Donovan swung by. He said he was attending his kid's tee-ball game and wouldn't hear the speech. But he wanted to glimpse the history unfolding on the waterfront. "It's great that he is running. It's really cool," Donovan said, without making an endorsement. And, predictably, Sanders' more colorful supporters began to arrive. Steve Schnibbe was maybe the least inconspicuous sight at the park that afternoon. 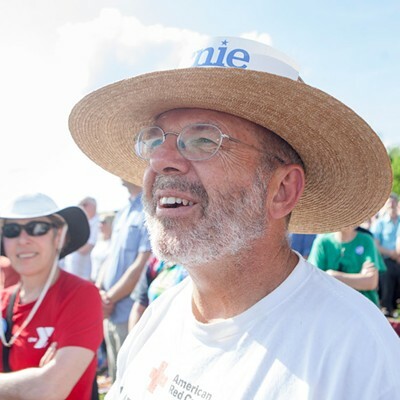 With a huge white beard, pants patterned with the American flag and a Bernie button atop a large floppy hat, he was like a light for the media moths. By 2 p.m., Schnibbe had already been interviewed by Rolling Stone and Bloomberg and photographed by a Vermont outlet. He didn't seem the least bit disappointed by the attention. "Dress for success," he chuckled. 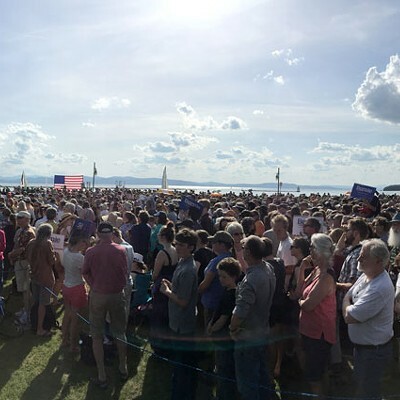 But by the time Sanders took the stage, Schnibbe was lost in a sea of 5,000 people. 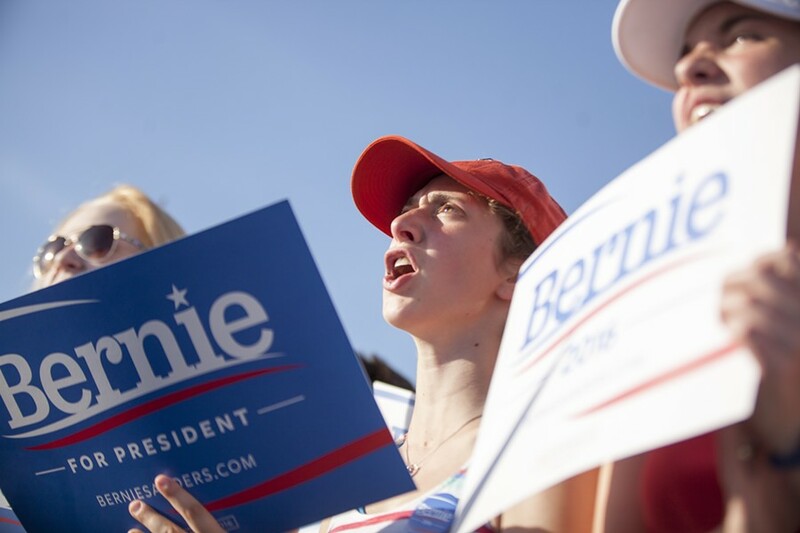 The crowd packed closely together and extended beyond the bleachers the campaign had set up. 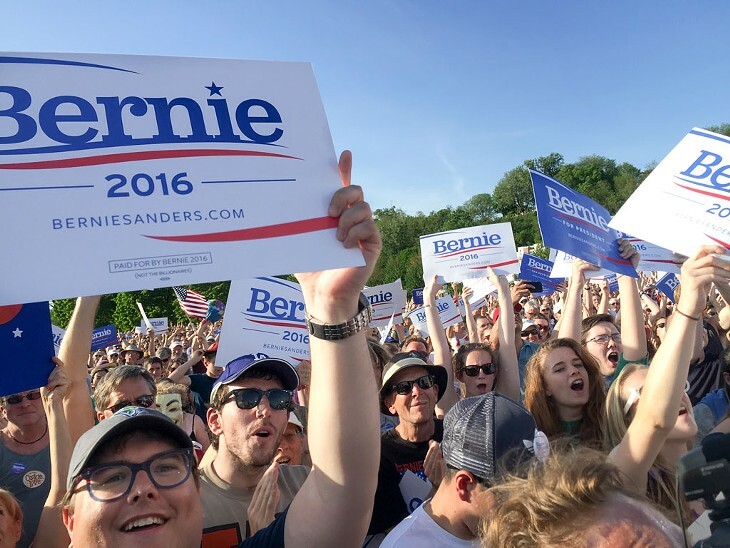 As Sanders railed against the Koch brothers and oligarchy, and everything else he finds wrong with the “rigged” economy, the crowd was unsure whether to clap or boo — but few stayed quiet. 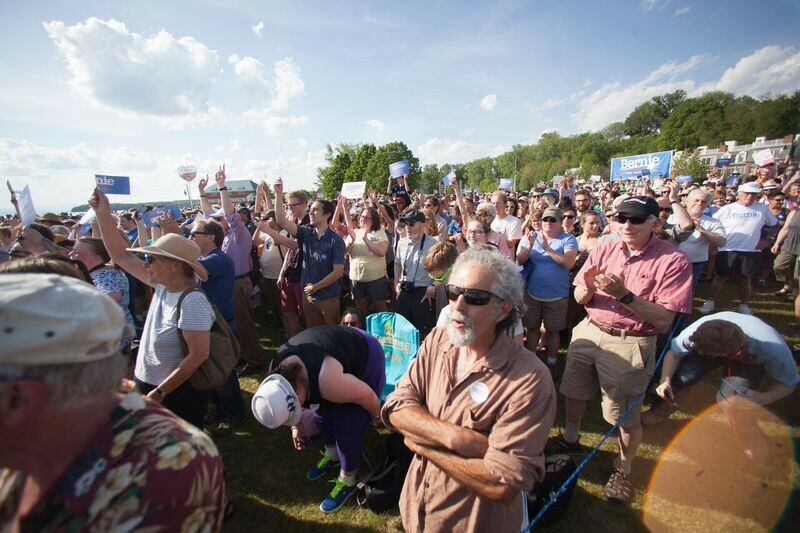 Sanders spoke for around 35 minutes, and the heat began taking a toll toward the end: A few people left early, and children started to squirm. 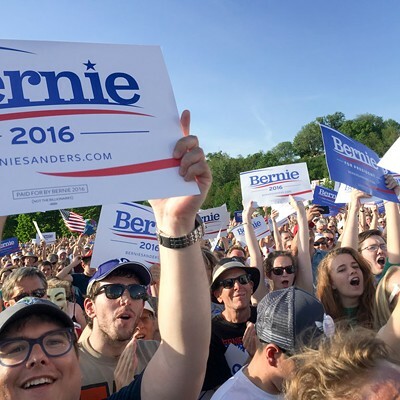 But most, even if their views were blocked, stood at rapt attention and listened to themes that some had likely heard Sanders revisit time and again. For the Tornabes, those themes were fresh. Earlier, they had said if they liked what they heard, they would consider voting for him. They might even bring one of their kids along to the polling place to set an example. "I wonder if you can take them into — what do you call it, the ballot?" Jonathan Tornabe said. "I wonder if they let them in."